Step by step tutorial on how to build create-read-update-delete (CRUD) web application using Grails 3 Angular 5 profiles with the working example. We already show you how to integrate Angular 5 as the front end with Node.js Express.js backend in this tutorial. Now, we have to show you how easy to integrate Angular 5 front end with Grails 3 the robust and enterprise-grade web framework. There is Angular profile comes with Grails 3, even there still using Angular 4, it's easy to upgrade to Angular 5. This time we are using Angular 5 as the separate application that will access or integrate with Grails 3 application by accessing the RESTful web service. So, there will be 2 application run at the same time on the same machine using the different port. For the database, we will be using default generated Grails 3 in-memory database using HSQLDB or H2. Now, let start the journey. After you download the latest stable Grails 3.3.1. On Windows you can extract to your local disk then add it in environment variables so, it will easy to call using the command line. On Mac or Linux, you can install it using SDKMAN. Open the terminal then type this command to install the latest Grails 3.3.1. If grails installed successfully, now you can go to your Grails projects folder. Type this command on the terminal or command line to create new Grails 3 application with Angular profiles. That command will create a new Grails 3 application and Angular 4 profiles with the application name `grails-angular`. Now, go to the newly generated `grails-angular` folder. To run the Grails 3 and Angular 4 application separately run this commands. Grails 3 run on the server and Angular 4 run as the client. To run both of them parallel, use this command. Next, check the running Grails 3 and Angular application on the browser by going to this address `http://localhost:4200` for Angular 4 application and `http://localhost:8080` for Grails 3 application. Now, you can see this page in the browser. As you can see, now Grails 3 page use `json-view` instead of the HTML page. So, the result will be a JSON response. Because the latest Grails 3.3.1 Angular profile still using version 4, we need to upgrade to Angular 5 manually. Fortunately, the official update guides are described here. But we just copy and paste the generated package dependencies from latest Angular-CLI. Open and edit `client/package.json` then replace all dependencies with this. Now, test again the application by running both client and server after back to the parent folder. For the data, we need to create a domain class or model on the server side. Type this command to create it after you go to the server folder. That command will create a domain class with package name `com.djamware` and domain class name `Customer`. We are creating a simple Customer data, open and edit `server/grails-app/domain/com/djamware/Customer.groovy` then replace all codes with this. Actually, there is `json-view` that comes with this Grails 3 and Angular Profile, but we make it fast using Grails 3 REST to make domain class RESTful. Now, just open another terminal tabs or command line then type this command to test the RESTful API. You will see this response on the terminal. Next, populate with this single customer data. That command will respond like this if successful. Simply as that, now you have your RESTful API ready to access from the Angular 5 application. Don't worry about the CORS for using the different port, because it already enabled by Grails 3 default configuration. We can create Angular 5 component while the Angular 5 application running. Open other terminal tab then go to `client` folder then type this command to create Angular 5 component. That command will generate all required files for build customer component and also automatically added customer component to app.module.ts. Before add any functionality to the component, we need to add `HttpClientModule` to `app.module.ts`. Open and edit `src/app/app.module.ts` then replace current `HttpModule` with this. Also, replace `HttpModule` in `@NgModule` imports. Now, we will making a request to Customer RESTful API using this Angular `HttpClient` module. Open and edit `src/app/customer/customer.component.ts` then add this import. Add array variable for holding customers data before the constructor. Add a few lines of codes for getting a list of customer data from RESTful API inside `ngOnInit` function. Now, we can display the customer list on the page. Open and edit `src/app/customer/customer.component.html` then replace all tags with this lines of HTML tags. To use customer component as default landing page, open and edit `src/app/app-routing.module.ts` then replace the current routes constantly. Don't forget to add the import for `CustomerComponent`. Before run and test the Angular 5 application, we need to clean up generated navigation structure and replace with the simple one. First, open and edit `client/src/app/app.module.ts` then comment this imports. Next, open and edit `client/src/app/app.component.html` then replace all HTML tags with this. Now, you can run again the application. This time we run the separate server and client application to make Angular 5 or client-side development smoother. On the other terminal or command line. Open your browser then point to `localhost:4200`, you will see this page. 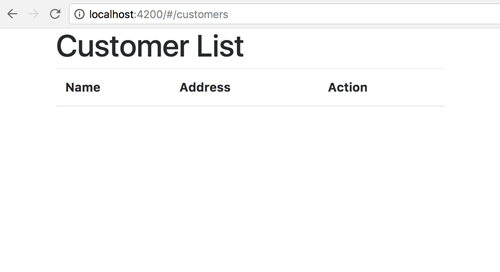 The customer list is empty, so we need to create a component to add the customer. Type this command in the client folder to generate it. Open and edit `client/src/app/app-routing.module.ts` then add this import. Add this route to the routes after customer list route. Add 'customer-create' link on `client/src/app/customer/customer.component.html`. Now, open and edit `client/src/app/customer/customer-create.component.ts` then replace all with this codes. Modify `client/src/app/customer-create/customer-create.component.html`, replace all with this HTML tags. Then add a router to the routes constant before redirect route. Open and edit `client/src/app/customer-detail/customer-detail.component.ts` then replace all codes with this. Open and edit `client/src/app/customer-detail/customer-detail.component.html`. Replace all codes with this. As usual, we will generate component for edit customer. Type this command for doing that. Open and edit again `src/app/customer-details/customer-details.component.html` and add edit routeLink after `<dl>` tag. Now, open and edit `src/app/customer-edit/customer-edit.component.ts` then replace all codes with this. Open and edit `src/app/customer-edit/customer-edit.component.html` then replace all codes with this. Open and edit `client/src/app/customer-detail/customer-detail.component.ts` then add `Router` module to `@angular/router`. Add delete button in `client/src/app/customer-detail/customer-detail.component.html` on the right of Edit routerLink. Now, it's time to test both client and server together. You see the data will be reset because we are using H2 in-memory database. And here the flow of the full Grails 3 Angular 5 Profiles CRUD web application. That it's, if you need the full working source code, you can find it on our GitHub.